An article in IEEE Spectrum introduces the new “Baxter” humanoid industrial robot from Rethink Robotics. 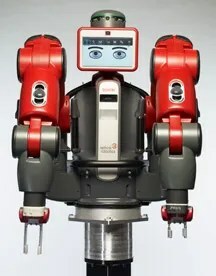 Rethink is a new company founded by famed MIT roboticist Rodney Brooks, who feels that Baxter is something truly revolutionary: an industrial robot that is simple, safe, easy to use, and affordable (about $22,000, which is quite cheap as industrial robots go). Several features of the Baxter robot are of particular interest to robot hobbyists. First, take note of the robot’s compliance, or ability to sense and react to the forces being applied to its joints. Baxter accomplishes this through series elastic actuators — that is, each motor is connected to a spring, and the spring actually drives the joint. However, with sufficiently smart servos and programming, you can do something very similar without springs. A good servo will report its torque and position, and if these are not what you expect for the current task, then some external force is acting on it, and you can respond accordingly. The trivial use of this is “pose capture,” where you have some or all servos go limp, you manipulate the robot into the pose you want, and then the software captures this as a pose it can replay later. But more sophisticated uses are also possible. The other notable feature is that the whole thing runs on Linux and ROS, the open-source Robot Operating System. ROS seems to be really taking off, and with great new embedded Linux platforms like the Raspberry Pi becoming available, there are fewer and fewer reasons not to jump on board. Check out the article, think about what lessons we can apply to our own robots, and share your thoughts below!